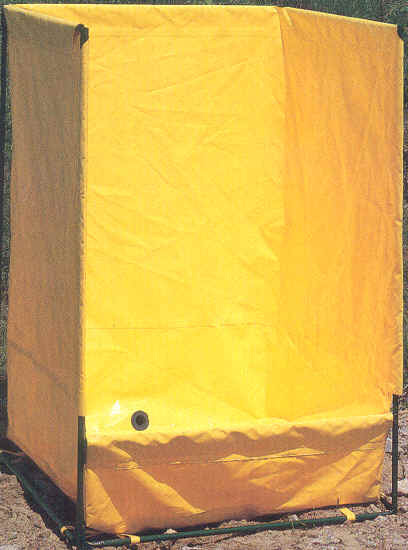 Portable decontamination booth confines the contaminated water from an emergency wash down within an industrial strength, 22oz. vinyl-coated nylon liner. Ideal for on-site use at a hazardous material incident, fire or any industrial plant that handles chemicals. Waste water drains quickly through a 1 1/2" outlet into any standard handling receptacle. Steel framework assembles in minutes. Includes carrying case for easy transport .Check out Burch Ag Kolaps-A-Tank for storing the waste water. Carrying case can be handled by one person, made out of 13 oz vinyl, heavy duty zipper and handles. Minimum Billing - $25.00, 25% repacking & rehandling charges on all returned units. FOB Fort Dodge, IA Prices are subject to change without notice, Effective date September 15,, 2008.